This preacher quickly defended his statement by quoting Psalm 37:25 – “I have never seen the godly abandoned or their children out begging for bread.” This man considered himself godly; righteous; virtuous; favored by God. Thus, no harm would ever befall him or his family. They were guaranteed the divinely-charmed life with no worries about the future, for God had written them a blank check. To hear advocates of this position explain, those who please God always land on top of the heap. Their cupboards are always full, their gas tanks never empty, their table always running over, and their checks never bounce. The reward for righteous living is a full belly. But what about the godly Christians of yesteryear who did literally starve to death? Women like missionary Lottie Moon who gave her food away to the Chinese she loved and served, only to die of malnutrition herself? There is St. Lucian of Rome, and countless others like him, who was starved to death in a prison cell because he would not renounce Christ. What about the millions of souls facing starvation and persecution in parts of Africa, the Middle East, and beyond, many of whom are faithful Christians? And going without bread is not the only disaster to fall upon the truly devoted. Christians worldwide suffer daily under the ruthlessness of various regimes. Believers living in radicalized countries are persecuted at all levels of society. Many people of faith daily bear the economic and social consequences of living out their beliefs. Is there something wrong with the faith of these people who meet trouble? Has suffering come upon them because they are unrighteous? Are they bad Christians? Is this the explanation for their misery? No, I don’t think this position will hold up for long; this idea that righteous living always leads to the good life. Countless numbers of good and godly people have suffered, have gone without, have been tortured, have been chained in prison, and have died by stoning, firing squad, holocaust, and worse. They suffered, not because they possessed an inferior faith, a faith not big or strong enough to get them out of trouble, but because of their unwavering belief. The writer of the book of Hebrews concludes that those who suffer this way are “too good for this world and earn a good reputation because of their faith.” So their stomachs didn’t growl because their faith was defective. On the contrary, they suffered because of their virtue. These heroes of faith weren’t standing behind a pulpit, in the midst of chaotic times, bragging about how the last bread truck in town was going to make a special delivery to their home, sent there by God himself. 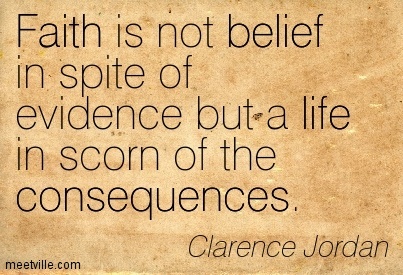 No, they led a life of faith, a life lived “in scorn of the consequences,” to quote the late Clarence Jordan, taking integrity as its own reward. After leaving the man who had called dibs on the last loaf of Wonder Bread in town, I was left to wonder myself. What happens to this kind of faith when the promised bread truck doesn’t arrive? What is the outcome when the pantry is found to be empty? When the last check bounces; when life produces more suffering than satisfaction? I imagine a chink in this armor of belief makes for one incredible crisis of faith. And it should, because faith that leads to arrogance isn’t faith at all.